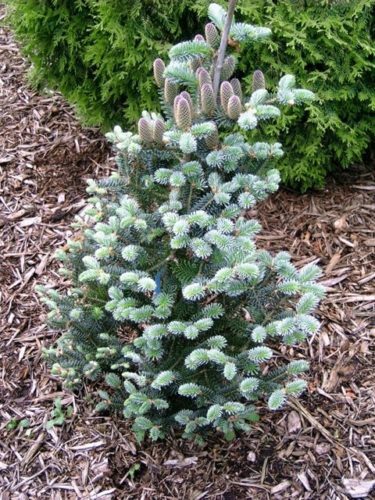 Abies koreana 'Blue Magic' is a slow-growing, upright, pyramidal selection of Korean fir with dense branching and exceptional, light Blue foliage. After 10 years of growth, a mature specimen will measure 20 to 32 inches (50 - 80 cm) tall, an annual growth rate of 2 to 3 inches (5 - 7.5 cm). This cultivar originated as one of several seedlings selected in the late 1980s by Kurt Wittboldt-Mueller Nursery, Verden-Eitze, Germany. Wittbold-Mueller worked with seed irradiated by cobalt, resulting in many intensely Blue seedling. Abies koreana 'Blue Magic' — photo courtesy of Henk van Kempen, The Netherlands, Dutch Conifer Society.